Kindergarten Form: Vaginal or Cesarean? By admin | July 6, 2015 | No Comments | Featured, New Mom? Cara Paiuk, a Connecticut mother was outraged when she came across a question on her son’s Kindergarten application. The forms, which were being filled out by her husband, asked if she had given birth vaginally or through a cesarean. Curious as to why the application would ask about her son’s birthing method, Paiuk called the school and was able to meet with the school’s head nurse and talk to the district’s outside medical advisor. 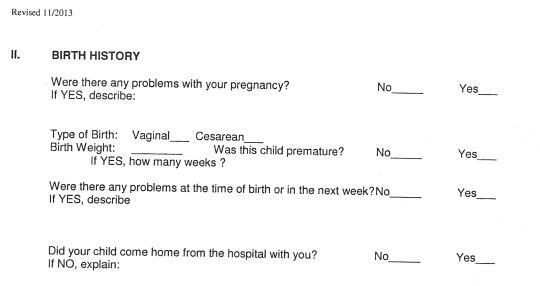 According to Paiuk’s essay in The New York Times, A Kindergarten Form Asks: Vaginal Birth, or C-section. Why?, the head nurse told her the reason for the question was so that a teacher or school administrator could look at the student’s medical history if they believe there is a problem. The nurse specifically noted that an umbilical cord wrapped around the neck and depriving a child of oxygen could lead to developmental problems. Since the invasive question has been brought to his attention, the superintendent of West Hartford Schools has said that he will be reevaluating all school forms for future students and parents.